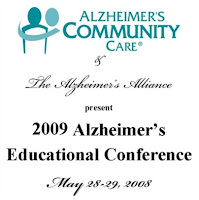 On behalf of Alzheimer’s Community Care Inc., and the Alzheimer’s Alliance, I am pleased to extend an invitation to participate in the 2009 Alzheimer’s Educational Conference, which will be held on May 28 & 29, at the Palm Beach County Convention Center in West Palm Beach, Florida. This annual event continues to break records, and the 2009 Conference will once again be one of the largest Alzheimer’s conferences in the nation, with more than 600 caregivers, family members and healthcare professionals expected to attend! In appreciation of your ongoing support, we are offering an early exhibitor opportunity exclusively for Alzheimer’s Alliance Members. Alzheimer’s Alliance Members who submit signed commitment forms prior to November 15, 2008, will receive 2008 Conference exhibitor pricing! Want even more exposure for your organization? Please consider one of the exciting sponsorship opportunities that will greatly enhance your ability to market your products and services! Please Note: A $100 discount will be applied to signed exhibitor commitment forms received prior to November 15, 2008. Exhibitor table placement is processed on a “first come, first serve” basis, so we encourage you to send in your commitment form today to guarantee a prime location within the Grand Exhibit Hall! If you would like additional information, or would like to discuss the various sponsorship opportunities available, please do not hesitate to contact me directly, or visit www.alzcare.org. We thank you for your continued support of this premier educational event and look forward to your participation in the 2009 Alzheimer’s Educational Conference! There is still time to register for the American Health Care Association’s 59th Annual Convention & Expo which takes place October 5-8th at the Gaylord Opryland Resort in Nashville. The Convention offers up to 14 specialized workshop tracks for administrators, owners/CEOs, CFOs, DONs and other long term care providers. Top presenters include Ted Koppel and Chris Gardner, with a performance by Wynonna Judd. Debbie Afasano of our staff will be the closing plenary session speaker. Click the banner above to register. State Finals lasts for 18 days and showcases over 3100 registered participants in over 70 sports and arts activities. Since the inaugural State Finals in 1985 to the present, drugstore this event has become a celebration in the truest sense of the word. It provides individuals from participants to volunteers, ed an opportunity to showcase their talents, enjoy being active, renew old skills and learn new ones. The gala Opening Ceremony of this annual event is on Thursday, September 25, at WakeMed Soccer Park starting at 6:30 p.m. with the Parade of Participants, torch lighting, entertainment, and special guests. With the largest number of Local Senior Games ever – fifty-four – the number of registered participants grow daily. Come and enjoy this celebration of the human spirit! Great parking and seating. Prior to the Opening Ceremonies, enjoy the Cheerleader Showcase at 5 p.m. at the SAS Soccer Park on Thursday, September 25. Watch performances by the Local Games’ Cheerleading squads from across the state. Join in the Funwalk prior to the Open Ceremonies. You are invited to celebrate the arts by visiting the Heritage, Literary, and Visual Arts Showcase at the NCSU McKimmon Center on Saturday, September 27 from 9:00 a.m. to 4 p.m. The Performing Arts Follies is on Friday evening, September 26, at 7:00 p.m. Get your tickets ($l0) at WakeMed Stadium on Thursday evening or at the McKimmon Center beginning at noon on Friday, September 26 or at the door before the show. This year’s Senior Expo is from 9:00 a.m. to 4:00 p.m. at the McKimmon Center. There will be exhibits from sponsors, coordinating agencies and various health and fitness organizations…free gifts and great information. Flue shots will be available! Event Schedule and Map for Raleigh events are available at www.ncseniorgames.org or call 919-851-5456 for more information. North Carolina Senior Games, Inc. (NCSG) is a non-profit organization that began in 1983 with a mission of creating a year round health promotion and education program for adults 55 years of age and better. Senior Games provides a holistic approach to keeping the body, mind and spirit fit while enjoying the company of friends, family, spectators and volunteers. Senior Helpers Releases Video Showcasing Their Services! Senior Helpers of Raleigh currently provides in-home companion care in and around the Raleigh metro area of Wake and Johnston County. Filmed on 9/9/08, hospital the attached video is a good reflection of the Senior Helper goal of helping people stay independent and in their homes as long as possible. Since the beginning of July this year, doctor Sharon Becker has been one of the many clients assisted by Senior Helpers. With no immediate family in the Raleigh area and in need of daily assistance in order maintain her independent life style, for sale she has relied on a caregiver from Senior Helpers to help get her through these past three months. All caregivers hired by Senior Helpers must pass an exhaustive national background check prior to being placed with a client and are matched based on the individual needs of the client. Hours of service for clients can range from 3 hours a day to 24/7. Additional information about rates and the services provided by Senior Helpers of Raleigh is available by calling 919-424-8349 or visiting www.SeniorHelpers.com . Comments Off on Senior Helpers Releases Video Showcasing Their Services! Fairfax Publishing Announces NEW Publication in the Florida West Coast! Fairfax Publishing Company, generic Inc. Comments Off on Fairfax Publishing Announces NEW Publication in the Florida West Coast! Fairfax Publishing Company, look Inc. proudly welcomes 2 new members to our team! Comments Off on New Team Members! In our quest to be not only the best, but the LARGEST senior housing resource on the web, we’ve recently added content in the Midwest, Southwest and Northwestern United States. Many exciting changes are taking place at SLG.com. Stay tuned! Comments Off on www.SeniorLivingGuide.com continues to GROW!